Postcards from Cairo: Goha and the Donkey Walk. There are stories all over the Middle East bout the 'wise fool' - a man portrayed as a rather dull and bumbling character with a huge store of wisdom. In Egypt he is Goha, in some countries he is Mullah Nasruddin. One of the pieces I took with me to France with the tentmakers was a Goha children's story. I have just had an email from a friend asking me to send an image to someone who wrote to her about it, knowing that she was the reason we were invited to France. I have written it up, and thought I would blog it since I am in heavy-blogging-mode today. Goha decides to teach his son something of life. He tells his boy that they will take a walk withthe donkey. Goha rides, and the little boy walks behind. They meet a man (represented only in the bottom corner - but you need to imagine him in every image) who is horrified. "It is shocking," he says, "that such a lazy father could exist - that you would allow such a little boy to walk while you selfishly ride the donkey." It reads as a circle clockwise! Goha is embarrassed and gets off so the little boy now rides while he walks behind. Another man is shocked that the father should walk while such a little boy adds almost no weight to the donkey. He points out, "the donkey is a very strong animal and both can ride on it. What is the point of owning a donkey if you insist on walking?" Both get on. The donkey's head is down and he is puffing. They meet another man who is very shocked that they should risk exhausting such a brave and honourable animal. "Get off and give him a rest," he says. "He is so tired." They get off and as they walk away the man calls out - "by rights, you should be carrying that wonderful little animal for all the good service he has done for you in the past. Then you will understand what it is to carry a burden all your life." Goha picks up the donkey and carries him the rest of the way home. The donkey is smug and smiling. When they reach home Goha says to his son, "I hope you learned a lesson from this." "Yes", says his son, "I learned that it would save a lot of changing places if we just carry the donkey in the beginning." "No, says Goha - "You learnt not to listen to anyone, but to make up your own mind, and to do things in the way you wish to do them without the interference of others. Listening to everyone and trying to do what they all want will make no-one happy except a donkey." 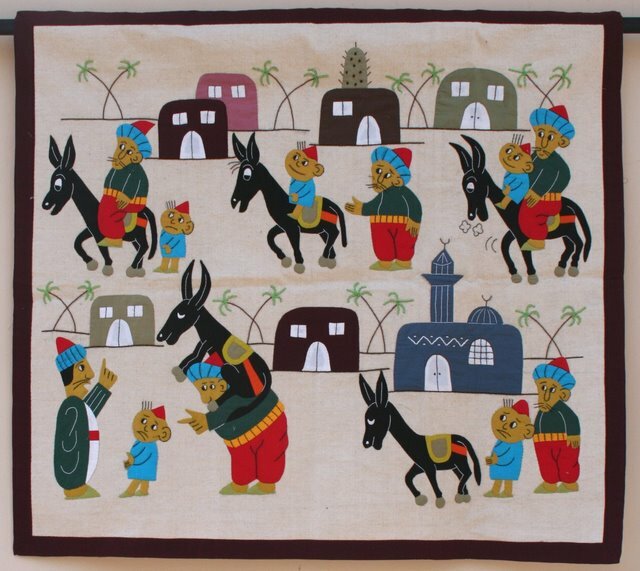 Jenny, the Goha and donkey story and quilt are very sweet. Thanks for sharing it.